The bacon-and-egg sandwich is a breakfast classic; ham-and-egg, standard as well. But if we had our druthers, we'd go for chorizo and egg every time. Why? The Mexican sausage—and we are talking the crumbly Mexican version, rather than the harder, smoked Spanish version—has a complex spice and often a slight vinegary tang, and when it's cooked, bleeds a deliciously spiced red oil that flavors everything it touches. The bread. Anything sturdy enough to contain the appealingly messy sausage. The Sycamore Kitchen, Los Angeles. 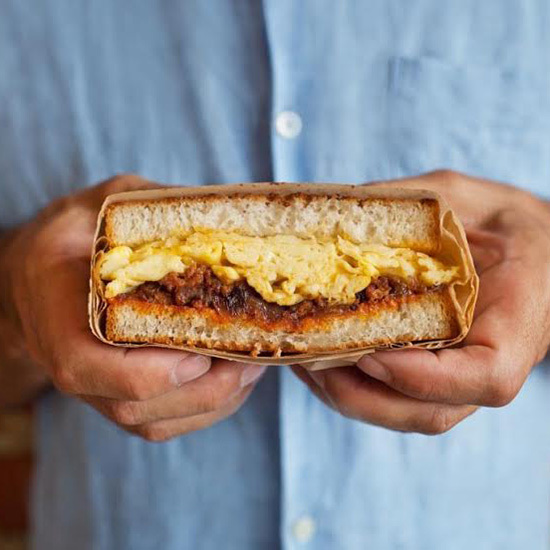 A precise ratio of housemade chorizo and fluffy scrambled eggs, plus melted Swiss cheese and roasted onions, cradled in pan de mie that's been heated on the griddle—I mean, just look at this thing (pictured at top) and tell me you don't want to chomp right in. Xoco and Tortas Frontera, Chicago. Rick Bayless, Chicago's preeminent Mexican chef, is a master of the torta, a Mexican sandwich often piled high with toppings. Among his best? The Egg & Chorizo on a crusty torta roll, layered with roasted poblano pepper rajas, melty Chihuahua cheese, and soft avocado. Egg, Brooklyn. This Williamsburg breakfast-and-lunch eatery is a master of meat, serving some of America's best ham and bacon, making its own scrapple and pork sausage, and, yes, its own chorizo in-house too. On the lunch menu, it's served in a sandwich with cheddar and scrambled egg, plus salsa verde, pickled onions, and a healthy slather of mayo.